What a HOT weekend it was here in TC! I was swimming in the Bay twice -- in May! Hopefully, the weather will be a little more comfortable this weekend for the runners who&apos;ll be competing in the Bayshore Marathon. If you&apos;re feeling a bit less athletic, you might think about venturing up the east shore of Grand Traverse Bay to the village of Eastport. That’s where they’ll be holding the seventh annual Antrim County Petoskey Stone Festival, a day of fun constructed around Michigan’s state stone. Admission to the festival is free, and events will include an official Petoskey stone hunt with prizes awarded for both children and adults, a stone-skipping contest among local dignitaries, hunting tips and demonstrations of Petoskey stone cutting, polishing and jewelry-making, as well as suggestions for turning them into “sculptures, household ornaments, and other works of art.” And, of course, all the food, drink, music and other entertainments that are de rigeur for a summer festival in these parts. I love Eastport, anyway. 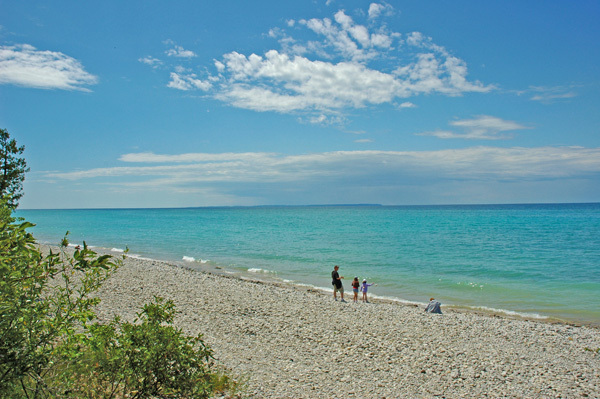 It’s a cute little town wedged between East Grand Traverse Bay and Torch Lake, and it’s home to Barnes Park, a large county-run facility whose beaches attract scores of Petoskey stone hunters each season. If you’re not from around here, you may not understand the fascination these ugly-duckling rocks have over us. Long before the water is warm enough for swimming, intrepid souls will be walking the beaches, their eyes glued on the smooth wet sand left by the retreating surf. Every so often, one of them will dart forward with a cry of glee to scoop a glistening gray stone out of the water. Truth to tell, these bits of sand-buffed limestone don’t look like much – and they’re even less impressive when they’re dry. But when properly cut and polished, they take on an entirely different character. Petoskey stones are ubiquitous, unusual, and instantly recognizable from their trademark pattern of sunburst hexagons. Whether gray, brown or honey-colored, they can be found in gift stores and jewelry shops throughout the state, cut and shaped into earrings, pendants, paperweights and other items. You can even buy them in the small gift shop in the Traverse City Visitor Center where I work. But most people prefer to find their own Petoskey stones. For more than a century, hunting for these odd-looking fossils has been a favorite summer pastime hereabouts. My wife digs them up in the yard when she&apos;s gardening, and has created a small mound of them under the kitchen window. 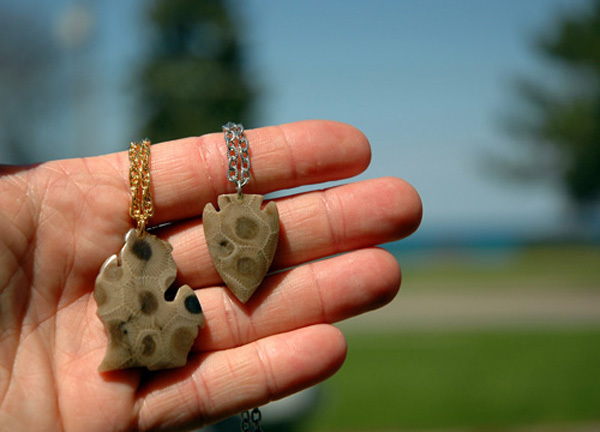 Although they’re named after the city of Petoskey, about 70 miles north of here, they can be found on most local beaches – and spring is really the best time to find them. That’s because the winter storms and the ice roll new ones up onto the beach from deeper water each year. But what is a Petoskey stone, anyway? And why are these oddly compelling rocks found nowhere else on earth? To answer those questions, you have to imagine a very different Michigan from the pine-scented hills and cool lakes of today – a Michigan that existed 350 million years ago, in the Devonian Period, when much of what is now North America was submerged beneath the warm waters of a shallow tropical sea. One of the most successful components of this rich, soupy environment were corals. Vast reefs of them, stretching for hundreds of miles. Petoskey stones are the fossilized remains of one particular species of prehistoric coral, Hexagonia percarinata. Devonian rocks are exposed in only a few places on the continent, and Northern Michigan happens to be one of them. And thanks to the hard-working glaciers that passed by in the relatively recent Pleistocene Period (a mere 2 million years ago) there are plenty of Petoskey stones scattered around on Traverse City area beaches. So, if rock-hunting is your thing, head over to Barnes Park on Saturday. You may find it’s an addictive pastime.